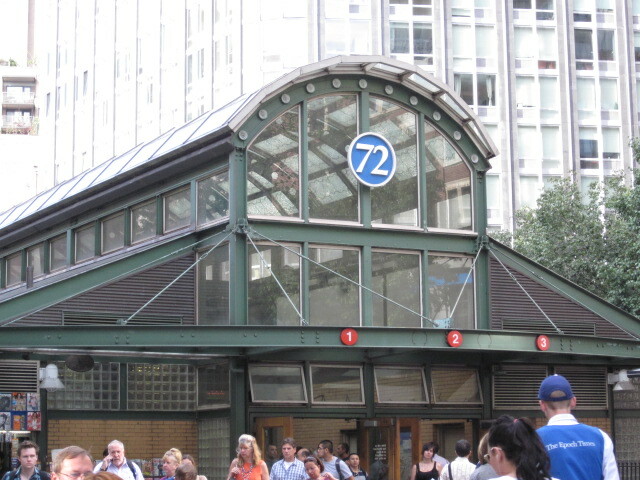 Strangers entering and exiting the 72nd Street Subway station on Stranger's Day. One woman in her early thirties seemed petrified, so much so that she scared me. I discussed her with my sidekick, Greg. Me: What do you think that was about? Greg: Could she have suffered a flashback to a time when she was brutally raped by a woman that looks just like you, dresses just like you, and was holding a weapon that looked just like a greeting card? Personalized Stranger's Day greeting card note or rantings of a mad woman? I arrived at work dragging my feet for I was still carrying one card that now seemed as heavy as a boulder. I conferred with Milton about strategy in an email exchange. Me: Wow, giving three Stranger’s Day cards out on the commute in is much easier said than done. Plus I didn’t see anyone reading The New Yorker this morning. Joy. Maybe everyone is boycotting it because they’re so horrified by Stranger’s Day? Milton (donning his Mr. Succinct chapeau): On the subway, people are on their guard for criminals. Me: Okay, he’s sitting at a computer in a place with WiFi. He was willing to accept the card. I can’t expect any more from him than if he asked me to write his comment on my site for him myself. Hm, should I have suggested that? 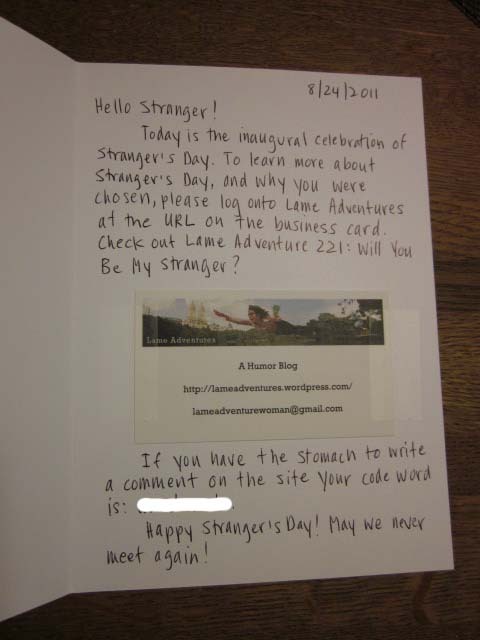 What I have concluded from this experience is that Stranger’s Day is rather strange indeed since it appears that 99.9% of the populace has no idea what it is and they’d prefer not to know more about it. A more appropriate name to some might be if it were called, “Don’t Approach Me Day.” Yet, if I had to do it all over again, would I? Hey, the definition of insanity is doing the same thing over and over again, but expecting a different result. I might be a bit off my rocker, but I’m definitely not a candidate for a strait jacket … yet. Still, it was worth trying once, but now I’ll gladly hand the Stranger’s Day baton back to its creator, Roz Chast … hopefully she’ll accept that from me.